The Digital Dealership System is the premier solution to digitize BMW dealerships with BMW digital service menus, BMW service appointment boards, BMW customer lounge TV, BMW touch-screen kiosks, BMW dare to compare service signs, BMW sales leaderboards, digital business intelligence, BMW showroom video walls, interactive digital signs, BMW car dealer outdoor led messaging and more. The custom designed, high-definition digital systems increase marketing of BMW dealer products, BMW services and specials, while maximizing customer engagement and staff motivation on screens throughout the modern-day BMW auto dealership creating a cohesive BMW digital marketing message as part of an overall 360 BMW Dealership strategy. BMW Digital Service menu boards provide digtal marketing of BMW service menus, service appointments, and BMW auto dealer service specials customized solution for BMW Service Centers as part of a complete marketing package. BMW Showroom digital signs provides auto dealers a BMW showroom marketing platform for BMW cars, sales specials, BMW auto dealer branding in an easy to update signage solution for BMW car dealers. BMW Dealer Customer Lounge TV provides BMW service customers marketing and appointment updates along with either broadcast TV, commercial free TV or the commercials replacement with BMW dealer content. BMW Service Appointment Menu automatically updates with BMW service appointments from BMW Dealer CRM/DMS and surrounds it with BMW Menu marketing and BMW service menu coupon specials and videos. 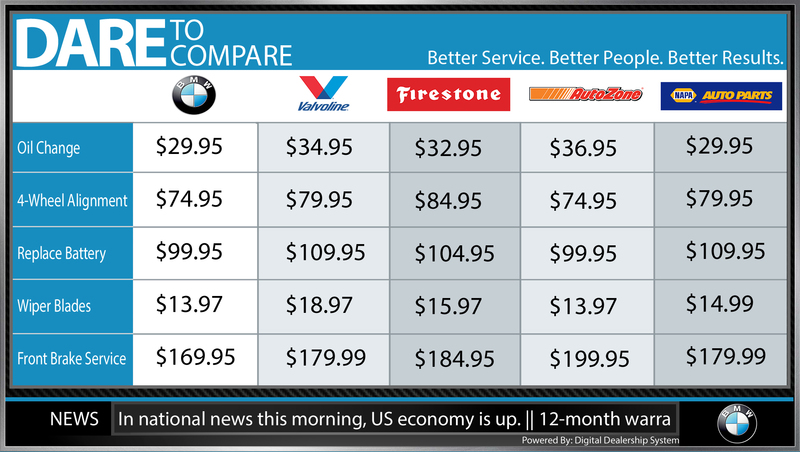 BMW Dare to Compare Service Menu allows comparison of BMW Services with other local BMW service shops. 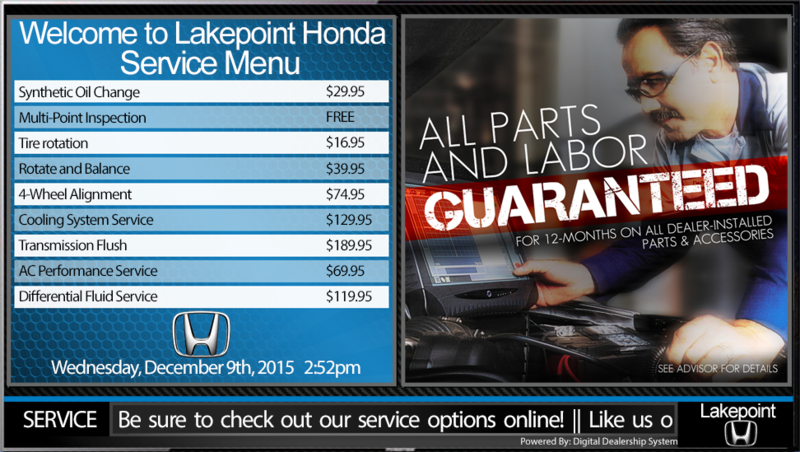 Remotely managed and easily updated for BMW Dealers service menu digital marketing. Touch-screen kiosks from the Digital Dealership System for BMW Dealers increases BMW customer engagement with BMW products and brand. Kiosks can be placed throughout the BMW auto dealership and at special events to reach BMW customers like never before! Kiosks can include BMW Inventory Kiosks, BMW Accessory kiosks, BMW Brochure kiosks, BMW Service Appointment Booking and Check-In, BMW car comparison Kiosk, BMW Financing Kiosk including BMW Value-My-Trade. BMW Auto Dealerships can benefit from multiple service and sales applications including BMW Customer Check-In, Trade Value, Inventory, Tire Search, Accessory Search, Customer Acquisition, Customer Check-In, Inventory Search, BMW Brochure Request and many more custom applications for the BMW Service and Sales Areas. BMW dealers can update the touch-screen kiosk solutions with remote management software making updating BMW digital marketing at multiple locations in the BMW dealership and mall locations simple. 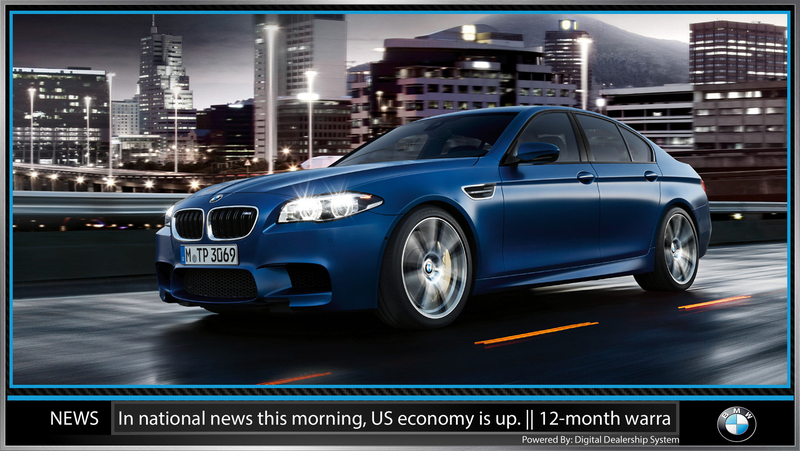 Utilize custom solutions to keep BMW marketing up to date. The exclusive screensaver application resets applications with BMW footage, ensuring that every BMW customer is ensured the same experience. Increasing CSI and BMW dealer profits through exceptional experience and BMW dealer processes through touch-screen kiosk solutions for BMW auto dealerships. Remote management software allows for updates and maintenance from any computer connected to the Internet using an intuitive and familiar interface. 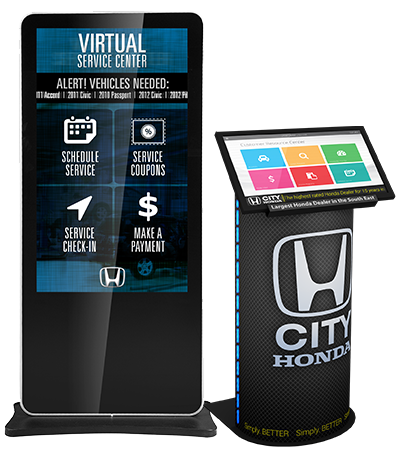 A customized layout is created for every dealership and every sign, making the Digital Dealership System signage solution unique for every auto store. Delivered plug-n-play ready, already preprogrammed for the dealership with colors, branding, logos to meet auto store specifications and location requirements. The Digital Dealership System offers multiple ways to entertain customers throughout the auto store with content from multiple sources surrounded in a customizable marketing message creates for compelling lounge TV media signage. All systems include preloaded content including custom car images, logos and branding. Pro Level Plans include videos of cars, animations, coupons, backgrounds and much more. The user is able to upload their own videos and images to any section of the system at any time. The ticker across the bottom of most profiles provides constantly updated information and draws the attention of customers and guests.. Standard feeds can be combined with dealer specific messages, Twitter, Dealer Rater and more - all customized in length and frequency. BMW Sales Leaderboards for Sales and Service create dynamic ‘bulletin’ boards for BMW staff to see monthly progress and provide a training, educational and motivational tool. Upload additional content to enhance the BMW leaderboard with BMW messaging, highlighting new BMW programs, incentives and top performers. 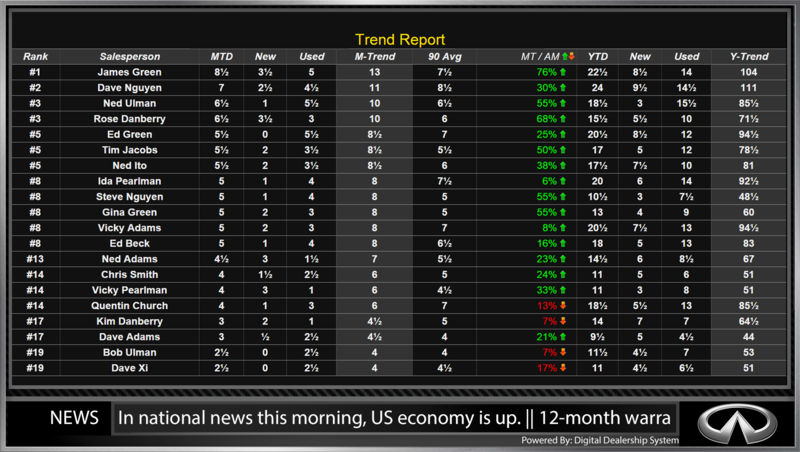 BMW Sales Leaderboards automatically update new, CPO, and used vehicles sold as well as MTD/YTD trends. BMW Service Leaderboards rank key service department measureables, revenue, and retention. 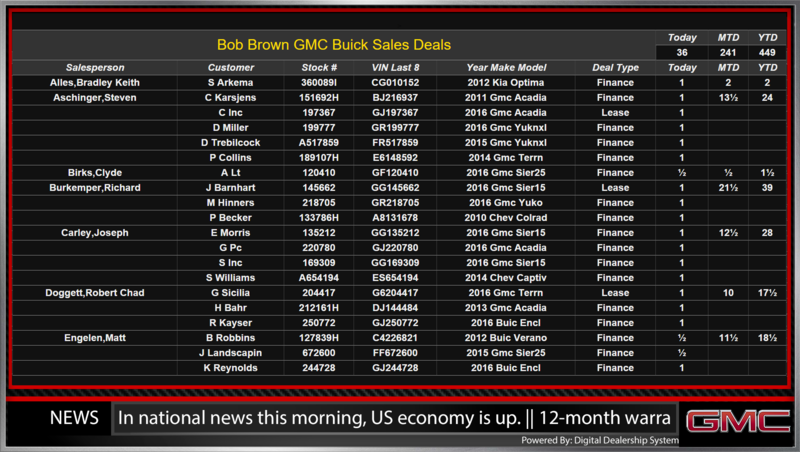 Automatically update tracking of new, CPO, and used vehicles sold as well as MTD/YTD trends. Add custom dealer messaging too. Ranking of key service department measurables in units and gross along with remotely managed BMW messaging! BMW Dealer Business Intelligence, runs on manager facing screens highlighting auto leaderboards, dealer trends & analysis, and key business metrics. In an instant, the BMW Dealer Managers and Staff can know where they stand as individuals and as a team providing ranking, motivation, and coaching opportunities. 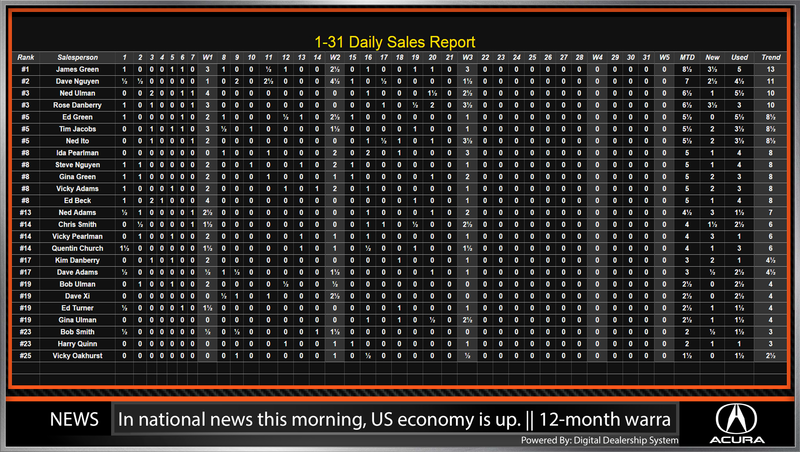 Replace BMW Sales Leaderboard white-boards and printed reports with dynamic digital BMW sales leaderboards showing updated sales and measurables. Key Sales Metrics highlight MTD and YTD Reporting of BMW Dealerships for an at-a-glance BMW business snapshot for BMW sales and service departments. BMW Employee Reports show metrics and key measurables for BMW employees for sales and service giving a business snapshot at a glance without printed reports. Service Menu Boards for BMW Dealers go much further then the fluorescent service menu light-boards and slider menu boards of BMW auto dealership past. 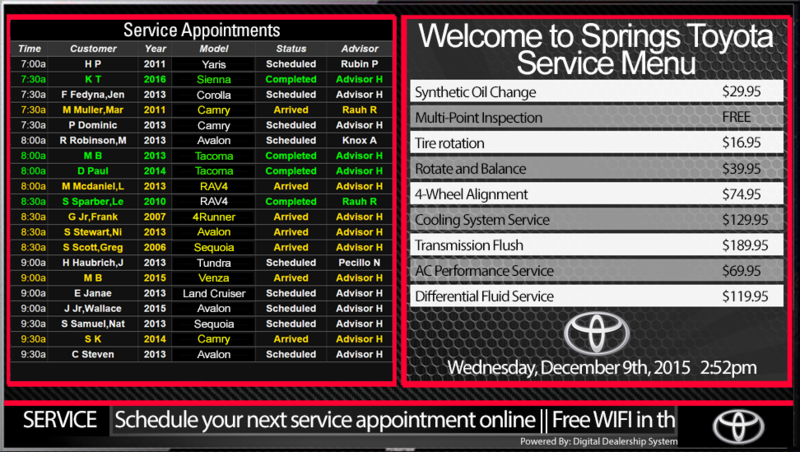 Enhanced BMW service menu board signage solutions from the Digital Dealership System allow dealers to communicate service pricing, BMW service specials, and much more with integrated video for sales, service, parts and accessories. 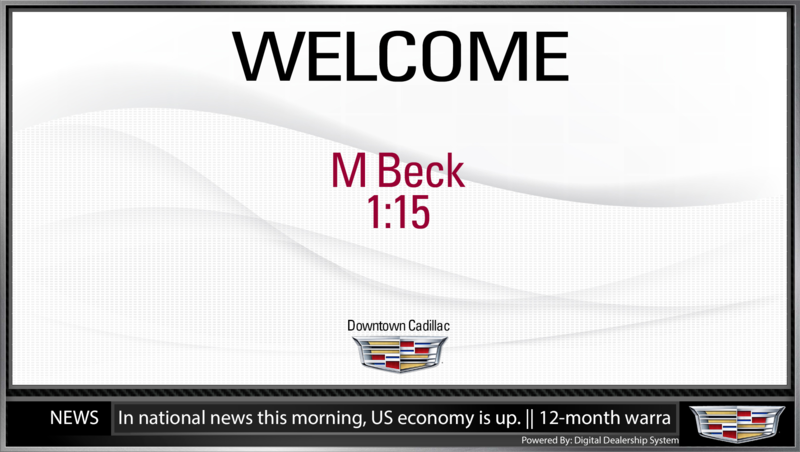 Add optional integration with many Service Menu Board Systems for BMW Dealerships including ADP, Reynolds & Reynolds, AutoMate, DealerTrack, XTIME, Time Highway, and DealerSocket - for truly informative BMW Digital Menu Boards. 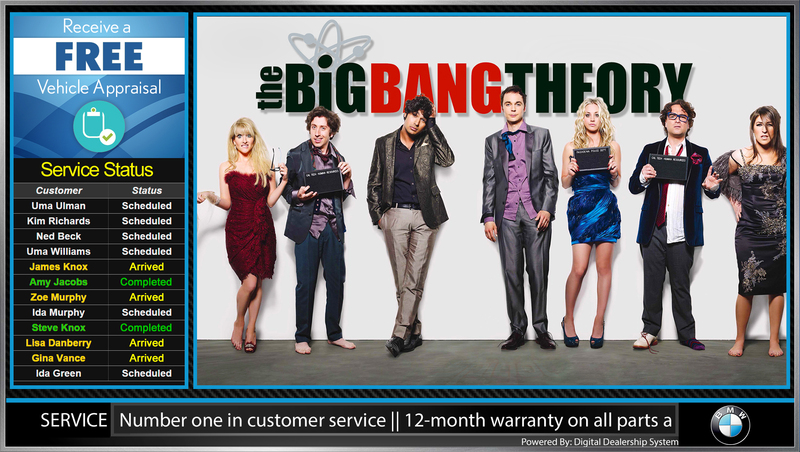 The BMW Service Digital Menu board offers remotely managed BMW service menu sides that can rotate through BMW service menus, BMW service coupons, BMW service videos and promotions. BMW Service Greeter Board welcomes guests into the dealership with their name and appointment time, automatically updating BMW Service Appointments from the DMS and popular CRM. Digital Dealership System is a registered trademark of Digital Dealership System, INC. All rights reserved. See more Kiosks. Trademark and Service Marks are owned by their respective companies and does not indicate endorsement, partnership or use for this product or service. Images for representation only.